designer Målfrid Gausel, Queen of Doll knitting, now available on the internet. Please enjoy knitting patterns for the most beautiful, gorgeous knitted doll clothes. The knitting patterns are designed by Målfrid Gausel. Each month the site gets over 50.000 visits and 150 000 page views, and visitors from about 150 different countries, enjoying Målfrid's amazing creations. Get the introductory knitting pattern ANNE for free! Sign up for the free Newsletter and immediately get your free downloadable knitting pattern (subscription form below). As a subscriber of our Newsletter you will get a special offer every time we publish new models. In addition to all the beautiful knitting patterns (see Newsletter and pictures below), Målfrid has designed a unique pattern, easy to work with, easy to knit. We want to give the knitting pattern, Anne, to all our new subscribers for free. To enjoy this special first edition of our Norwegian doll knitting pattern in English, write your first name and email address into the form below, click submit, then you can immediately download this incredible model. We also offer you a few of Målfrid's other beautiful designs, absolutely free; subscribe to the Newsletter and you will get the pattern ANNE and the different bonus patterns with the next newsletter. As a subscriber of the newsletter some of the new patterns will be offered to you at special price, up to 40% off full price. 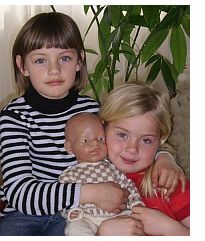 Målfrid creates patterns that fit 17"-18" (43-47 cm) dolls like American Girl doll and Baby born doll. The patterns match other dolls of similar size. Målfrid, the author of these books, is inspired by her grandchildren (Kaja and Tiril to the left), and every design and creation comes from her heart. To give you a taste of what Målfrid has accomplished, take a look at the four images below. Maalfrid, the author of five pattern books, for decades she has been a doll knitting pattern celebrity in Norway, very well known for her fantastic books featuring doll knitting patterns. You can read about her beautiful creations in the newspapers and magazines. She's a popular speaker at many events. 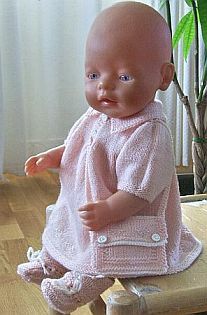 People everywhere are talking about what she loves, designs and lovely knitted doll clothes. Click on each photo below and enjoy some of the beautiful creations presented in her books. The books are unfortunately only in Norwegian, the two first books are even sold out in several editions and will never be printed again. Here is the good news! Most the patterns from these books will be published on our website, one at a time. Click on each image below and see some of the beautiful creations presented in her books (written in the Norwegian language only). These books are written in Norwegian, however all knitting patterns at this site will be in English. The patterns are downloadable. Målfrid has many great models still to come. She will of course ask you, our dear visitors, what you would like her to design, which type of doll clothes you would love to knit. We have a baby knitting pattern webpage. 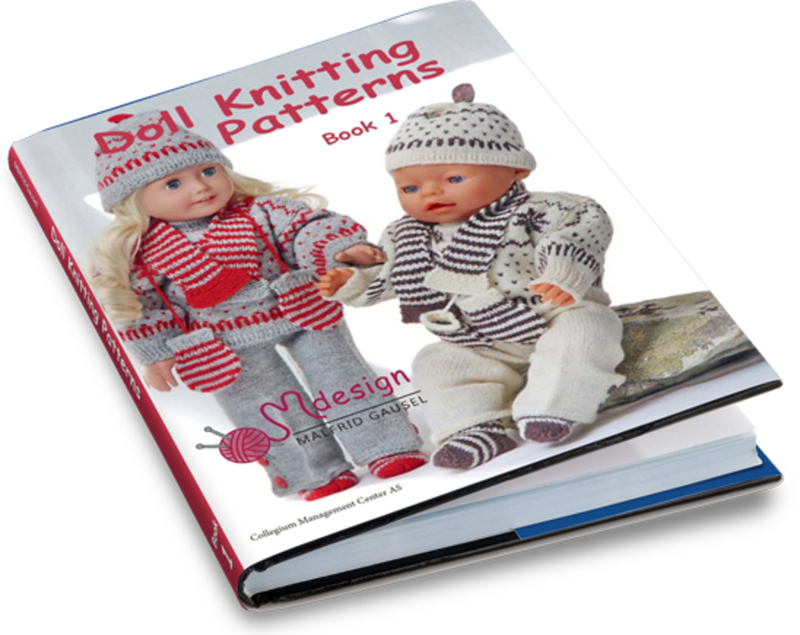 Some of our gorgeous doll knitting patterns will be offered to you in baby sizes. All our doll knitting subscribers will get the introductory pattern MIO for free. I just want to tell you that I love your patterns and am so delighted that you will be publishing a book with your patterns in English. Also, you are putting on your website patterns from your books that are written in Norwegian. Thank you so much for these lovely patterns. I especially love the patterns for babies as I knit them for premature babies. You do beautiful work! If you experience a problem, please contact us direct using the contact us form. We urge you to do so. We try to give service far beyond expected and we do strive to maintain our reputation. Wow, I am so very impressed by all your wonderful designs - there is a fantastic variation of styles and all beautifully knit. I lovely to work with fine yarn too, it's in proportion with the dolls size. Your pink baby dress is on my todo list - can't wait. Thank you so much for such beautiful designing.